‘Wizard of Words’ Trivikam’s new romantic entertainer ‘A…Aa (Anasuya Ramalingam vs Anand Vihari)’ featuring Nithin and Samantha in the lead roles has completed its talkie part and gearing up for release on may 6. 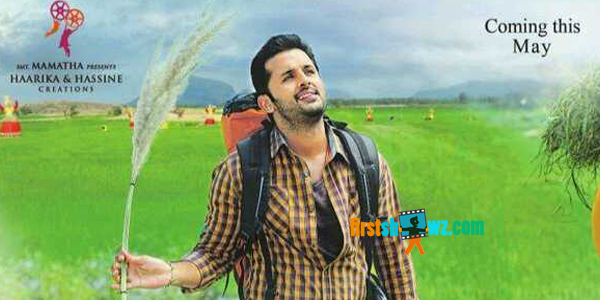 The first look stills and posters were released on hero Nithin’s birthday today (March 30). Producer Suryadevara Radhakrishna, who is producing the movie under the banner of ‘Haarika and Hassine Creations’, said that he is very happy to be associated with this project and he is very confident that the romantic family entertainer will be a visual treat for the audience this summer. He also praised music director Mickey J Meyer’s music. ‘A…Aa’ starring Nithiin, Samantha, Anupama Parameswaran in the lead roles will complete its entire shooting process by end of April first week. Other prominent cast members are – Nadiya, Ananya, Eeshwari Rao, Sana, Giribabu, Posani, Naresh, Rao Ramesh, Avasarala, Praveen, Raghubabu and Srinivas Reddy.